What if our customers could see everything we do? Being transparent and opening our doors to our partners allows us to make more conscious decisions. This report is the result of our long-term commitment to build an ethical and sustainable business. 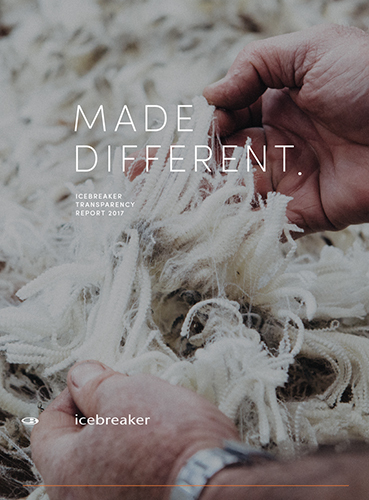 In 1997, icebreaker became the first company in the world to establish long term contracts with key merino growers. They were based on genuine trust and a mutual concern for animal welfare and the environment. Guaranteeing the five key freedoms for our flock means you can feel happy in the knowledge that the sheep felt just as good making your Icebreaker merino as you will wearing it. Today, our business reflects our dedication to natural solutions. More than 84% of our global fabric composition is natural fibre and only 16% is man made. 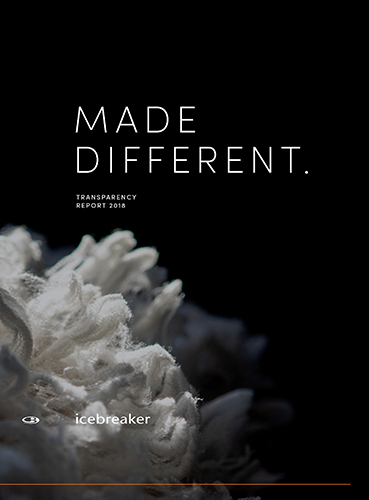 icebreaker has maintained its transparency by developing a business based on close, long term relationships. We know exactly where our garments are being made. We take responsibility for the whole ecosystem. Lead the industry to natural fibre product solutions, by aiming to replace and reconstitute all remaining synthetics in our product line. We will fully exit from using acrylic by ss20. In 2019 launch a water-soluble bag for the distribution and delivery of product. Publish a 5-year sustainability roadmap defined by our materiality assessment with integrated business goals.